Who will start against Bills, Josh McCown or Sam Darnold? Signs point to Darnold, but Jets coach Todd Bowles says he'll decide on Sunday. FLORHAM PARK, N.J. -- Sam Darnold took the shotgun snap and tossed a perfect pass to Jermaine Kearse in the left side of the end zone Friday. That was at an indoor practice, though. Can the Jets now count on their rookie quarterback tossing passes outdoors Sunday in Buffalo? After missing the last three games with a strained right foot, Darnold practiced fully for the third straight day. Unlike the previous week, there was no “questionable” designation on the injury report. But Josh McCown also practiced fully Friday after two limited days because of a back issue, and he also had no designation under “game status” on the report. 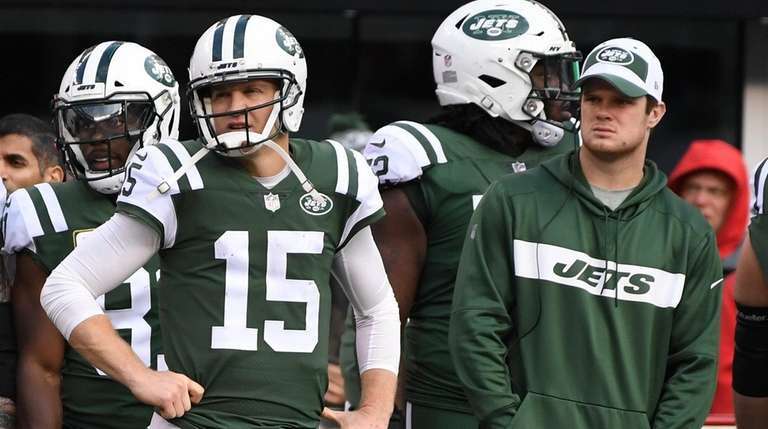 While the arrows seem to point toward Darnold being out there again, coach Todd Bowles wouldn’t commit to that. Bowles also can keep the Bills guessing this way. So what will be the big factor in the decision? Darnold needs more game experience, though. Despite not having played since Nov. 4, he still leads the NFL with 14 interceptions. Four came in his last game at Miami. “He’s got to get better with reads -- and he will with playing time -- progressions and getting in and out of the huddle, which he’s been doing a good job at before he got hurt,” Bowles said. The Jets are out of the playoff puzzle for the eighth straight year, standing at 3-9 and riding a six-game losing streak. That includes a humbling 41-10 loss to the Bills (4-8) with McCown starting on Nov. 11 at MetLife Stadium. The offense didn’t find the end zone much in Darnold’s last three games and the last three with McCown. The unit produced five touchdowns in the six games, including none in the 26-22 loss at Tennessee last Sunday. The Jets, who ran 33 times for 156 yards, had five field goals and a pick-6.